Natural Disasters and Theatres: What to Inspect After Floodwaters Recede. Natural disasters are an equal-opportunity force of destruction, with no regard for whom or what gets hit with devastating consequences. That was certainly the case when Hurricane Harvey, a massive Category 4 hurricane, hurled more than 50 inches of rain at the heart of Houston’s vibrant performing arts scene. Just over two weeks later, Hurricane Irma tore through Florida. It was the first time that two “Cat 4” storms hit the U.S. in the same hurricane season. In this blog, we offer some “next steps” on how to revive performance spaces damaged by floodwaters. Complicating the recovery is the unpredictable nature of Mother Nature. 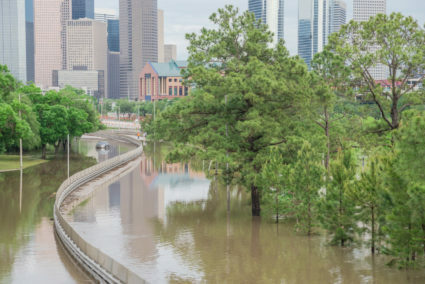 As venue managers in Texas and Florida can attest, the amount of water and damage varied dramatically, based on floodwater height, venue location, and perhaps, luck. Yet, there was no denying each storm’s impact on many surrounding performing arts spaces. As one Houston news outlet reported, “[Hurricane] Harvey’s wrath flooded virtually every major performing arts venue in the downtown district.” All told, it’s estimated the entire area sustained billions of dollars in property damage alone. For theatres drenched in floodwaters, how does physical recovery begin, especially if water reached rigging components and staging? Has safety been compromised? Who can declare “repair” or “replace”? For answers, we asked J.R. Clancy Service Manager Anthony Seifritz to weigh in. As the service contact of our TIM® (Training, Inspection, Maintenance) program, he is familiar with the damage caused by natural disasters. J.R. Clancy has previous experience helping Hurricane-damaged venues with product replacements and safety inspections, including the Mahalia Jackson Theatre in New Orleans after Hurricane Katrina. The most sinister of all hurricane hazards is water, Seifritz explained. It can wreak havoc on performing arts essentials, especially if they’ve been submerged. All equipment should be carefully – and professionally – inspected for rust, mold and deterioration. Any water contamination, not just floodwater, makes an inspection essential. “Products that are not properly inspected after water damage can be potentially dangerous if their functionality has been compromised by rust and rot, or by the ceasing of mechanical components whose lubrication has been diminished,” Seifritz warned. No matter the natural disaster, the Wenger and J.R. Clancy team is committed to helping you restore and maintain a safe, reliable venue. In addition to a complete line of manual and automated rigging equipment, J.R. Clancy offers TIM (Training, Inspection, Maintenance). The program’s goal is to ensure the safety of your people and the integrity of your facility, while also keeping you compliant with the latest ANSI standards. Seifritz welcomes any inquires to help keep venues healthy and safe for staff, students, performers and audiences. To learn more about our TIM program or to schedule services, contact the J.R. Clancy Service Department at 1-800-836-1885 or service@jrclancy.com. We’re happy to provide any level of help needed to get your venue back in business. Gaines, Tarra. “Houston Theater District suffers heavy damage, but arts groups keep their heads above water.” Culture Map Houston, 28 Aug. 2017. Web. Sept. 2017. Catch a technology triple play at LDI!